This apparently simple maneuver can waste your entry money in 30 seconds or less. In this series, I look at this crucial element of ringcraft in order to maximise your competitive potential. 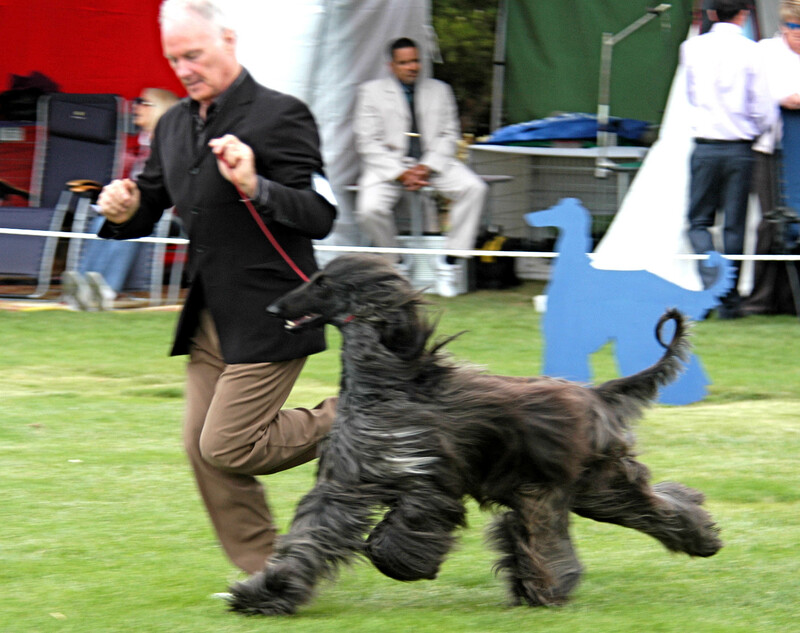 Showing dogs requires presenting our dogs to the judge in a number of maneuvers to illustrate how their structure compares to their breed standard. Of all the maneuvers that we as handlers are asked to perform, the ‘straight out and back’ seems the easiest and simplest to carry out. What could be simpler? Just run the dog over to the fence and back again. Nothing to it! The problem is, and what many handlers forget to remember, is that the straight up and back tells the judge just about everything they need to know (aside, of course, from the dog’s side gait) about how you’re dog is structured in terms of its conformation. When your dog is going away from the judge, it reveals how the rear section of your dog works, where the rear legs place on the ground, whether they move straight or cow-hocked (the point of hock of each leg pointing inwards), or splaying to dissipate the ground. It also shows if your dog drives to the optimal standard required by its breed by showing a full view of the pads of each foot. It also demonstrates whether your dog is in control of its front by revealing if the elbows can be seen when the dog is moving away. That’s quite a lot of information that the judge is able to appraise in terms of the structural and functional performance of your dog in one simple maneuver, isn’t it? When you reach the fence and turn around to go back, another set of circumstances present themselves to the judges. The judge can see how your dog’s front section works while gaiting. If there are any weaknesses, such as turning in or out at the pasterns, tucking in or splaying out at the elbow, or if the dog lacks depth of chest and therefore nothing to keep the elbows out, or the opposite, too much chest and pushing the elbows out, all of these will indicate to the judge any structural inefficiencies of your dog. Also, on the return, the judge can observe the head carriage (showing breed attitude) and, coming to a halt, the front feet placement. Not bad for just running over to the fence and back. But would you believe that this one maneuver causes us more grief than any other? You know that when you pull one way you actually make your dog pull the other – right? So if your dog is subjected to any sideways pressures through the lead it does not move truly but splays its feet in an effort to counteract the pressure of your pulling. So what the judge observes in your straight up and back is not the true dog but a man-made version created by you, the handler. What’s funny about this is that when the judge awards another dog the blue ribbon you leave the ring complaining, “How couldn’t the judge not awarded my dog”? But you didn’t see what the judge saw. You didn’t see your dog scrambling to control its balance and, as a result, not moving to its best and most natural potential. To avoid this happening during your up and back, run your dog on a loose lead – not a tight one. This way your dog won’t be trying to counter balance itself. Allowing you to present the judge with your dogs true movement. Do you have trouble running smoothly alongside your dog in your up and backs? Is so, what do you think the problem is?